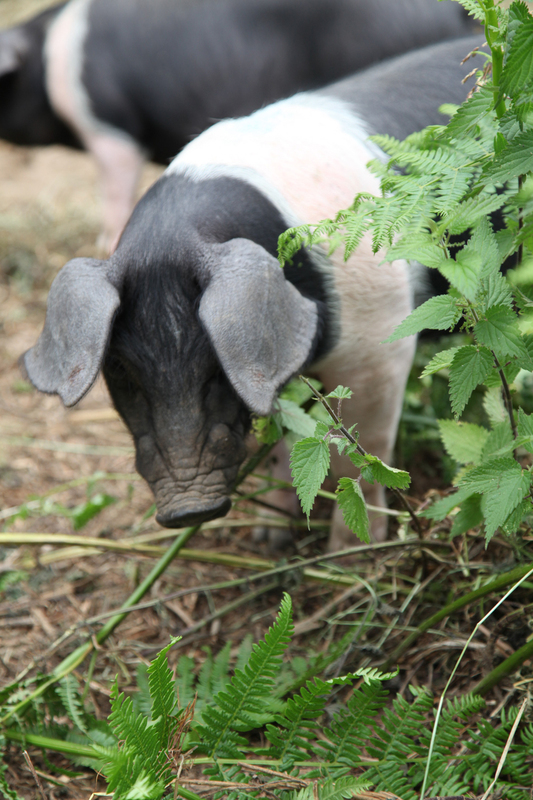 Young saddleback pig eating bracken. We are excited to see some new arrivals at Stansted. Our first Saddleback pigs have arrived from Manor farm in Botley, which was the farm where the BBC filmed ‘Wartime Farm’. We are hoping to have some delicious woodland pork by September. The pigs will help clear some of the Stansted woodland to help with forest regeneration. They love nothing more than a mouthful of nettle or bramble, and clear large areas very effectively. Their rooting behaviour ploughs up the earth, encouraging a diversification of plants and tree regeneration. They act as the once indigenous wild boar used to do, taking out bracken (they are particularly partial to their roots) and allowing tree saplings to thrive. The advantage for us is pork that has been fed a varied diet in a natural setting. Their diet is supplemented with additional food, including waste vegetables from the Farm Shop. But they will eat mushrooms, acorns and chestnuts, as well as much of the brush. It should result in fantastic tasting meat. We will be selling the pork at the shop, so do let us know if you are interested in a quarter pig for the freezer, as we will be taking advanced orders. The pigs are currently 8 weeks old and will be fattened up for another 8-12 weeks.